FARMINGTON – A gentleman who sat on Farmington’s municipal bench for many years is being honored with a public bench in his memory outside Farmington’s municipal offices. 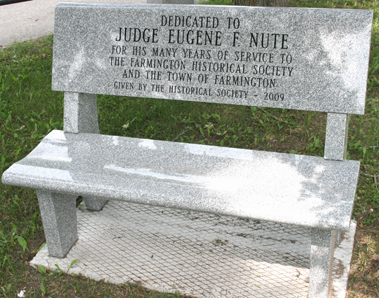 This fitting tribute to the late Judge Eugene F. Nute - a gift from Farmington Historical Society, to which he belonged for many years, and served as its first president - will be dedicated at the end of July. The granite bench is already in position, under a shady tree, and beckoning, like an apple in the Garden of Eden, those toiling masses too weary to stand around for three weeks waiting for the official blessing. It took a committee, of course – a Farmington Historical Society Judge Nute Granite Bench Committee - to convert the organization’s liquid assets into something as concrete as granite, and the trio appointed to this task comprised Dottie Bean, Lorraine Meyer and Jean Pease. Like the judge, himself, none of them are strangers to Farmington Corner, which has strived to record important town happenings over the past quarter of a century – incidents like the attack on the Hole-in-the-Barn gang who once plagued the Bean farm, or Lorraine’s narrow escape passing an arcing transformer while wearing a metal dress. Several years before this, the selectmen had placed parking meters along Main Street, but these created seething resentment in the breasts of a citizenry ever ready to rebel against local government oppression at the drop of a ball cap. When some anonymous buck, one night, cut all the parking meter stems, many sectors of society were openly gleeful. Undaunted, the selectmen went low tech, and bought Brownie a tire chalking stick. The police sergeant, as duty demanded he must, wielded it with impartiality, except that the only people who parked on Main Street for more than two hours were the members of Farmington Woman’s Club (among them Jean Pease) on the afternoons they played bridge. Thus, the Woman’s Club, which was a powerful political force in those days, and which could make or break a man over a cup of tea, felt victimized. An ally was sought in Farmington Business Association, and hence Parking appeared on the FBA agenda. During the discussion about the chilling effect of the Chalk Stick on retail trade and card games, florist Stuart Pease revealed that his mother had a drawer full of unpaid tickets. At this, Judge Nute sat up it his chair, and uttered the enigmatic word, "Ooooh," which Farmington Corner reported but did not dare to interpret. Shortly after this incident though, the Chalk Stick was mysteriously withdrawn as an instrument of municipal persecution, and civil disobedience carried the day. Judge Nute’s court, ever packed with defendants, their numerous supporters and a ragtag army of kibbitzers perched at the back of the room, was often the scene of unusual compassion. Take the case of Smokey LaPanne, a well-known dog with a disconcerting white eye that padded up to Main Street day after day, in defiance of a leash law. Farmington Corner reported that Judge Nute read a letter from Mrs. Mary LaPanne, in which this canine curiosity was described as a lovable collie that visited Mros' Variety Store for its daily hot-dog, and said "Hello" to everyone. "Recognizing immediately that talking dogs could be the cornerstone of a tourist industry, wise Judge Nute waived a fine," this column reported. The court’s peanut gallery had muttered and nodded in agreement with this inspired legal opinion. That same year, 1985, a tougher case came before the judge, and truly tested his Solomon-like qualities. Police Officer Nick Quinn, one Saturday night, had tried to intervene, delicately, in a lively fight outside Christie’s bar. The court was told that after his pleas for peace were repeatedly ignored, the police officer’s front-line weaponry - the electric zapper - was brought into play. Royce Hodgdon of Royce’s Stoves and Freezers now faced charges that included police assault. The judge didn’t buy the accused’s explanation that a reflex reaction to the zapper had lead to Officer Quinn being kneed twice in the groin. That being established, a visiting judge, unacquainted with the nuances of small town life, might have sentenced Royce to a spell in the county farm, but the Hon. Eugene Nute was aware that, had he done so, dozens of people in Farmington would be waiting 120 days for their stoves and freezers to be repaired, instead of a mere 60. Thus, Judge Nute gave Royce 100 hours community service instead, and he came to work for the Parks and Recreation Department with a right good will, helping to build flower planters all over town, which benefited the whole community. Since those days, Nick, Royce and Eugene have all passed on. Brownie too, for that matter, and maybe their ghosts are sitting on a granite bench, somewhere, chewing over those old times. Judge Nute’s obituary, published in the spring of this year, closed with these descriptive words: "… a gentleman of honor, integrity, generosity and humility in all he did in a life dedicated to service to others and to his family..."
Hear, hear! Let’s raise our glasses. Judge Nute's bench: dedication date - Thursday, July 30, 2009 at 10 a.m.